Growing vining vegetables in the home garden requires adequate room for the spreading vines. Many prefer to grow them on trellises to save space, keep the fruit off the ground and make harvesting easier. Vertical fences, latticework or individual cages or supports provide the structure needed for vines to climb upward. The structure chosen depends both on the size of the plant and fruit at maturity and on how the vines develop. 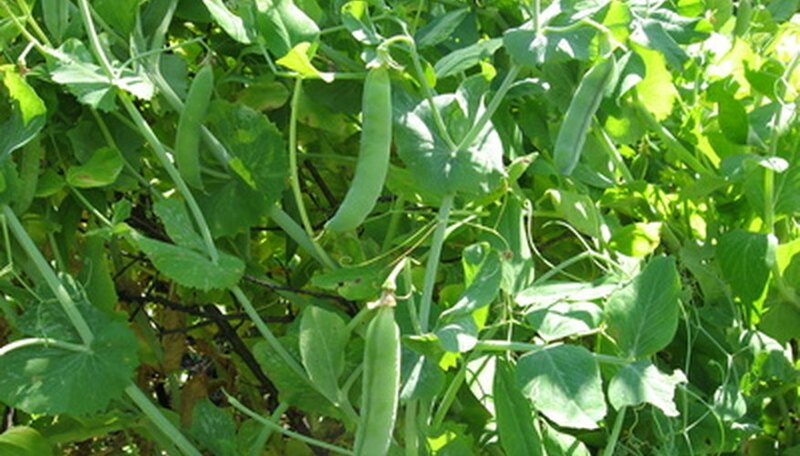 Vegetables like peas produce tendrils that intertwine with the structure, while climbers, like pole beans, prefer to twine around the structure and grow well on poles or garden stakes. Cucumbers grow on long vines that contain tendrils making them ideal for wire structures like hardware wire or chicken wire. Although the trellis can be positioned in an upright position, many gardeners prefer a teepee or dome shape to the trellis. Others prefer a cylinder made from hardware wire that sets over the cucumber plant. Vines grow up the inside of the wire and down the outside. Peas grow rapidly and produce tendrils making them suitable for upright fences. Common fence materials used by gardeners consist of chicken wire, chain linked fence, plastic garden fence or hardware wire. Erected 2 to 4 inches from the base of the plants, these fences provide support for the plants and make harvesting quick and easy as the pods hang down in plain view. Pole beans vine to 6 to 8 feet in height. These rapid growers prefer structures that allow them to twine around a solid pole or stake. A 6-foot pole anchored into the ground provides support for two to four bean plants. A teepee made from six to eight poles, with bean seeds planted around the base of each pole creates an attractive trellis for beans and allows good airflow to prevent disease. Squash and pumpkins vine freely with some vines covering 12 to 20 feet. Growing squash and pumpkins requires adequate room for vining. Although they can be grown on a trellis, most gardeners prefer to allow them to vine freely in an open area. Their large fruit and massive foliage make trellising a challenge. Melon vines vary in length from short 4 to 6 foot vines to lengths of 10 feet or more, depending on the cultivar grown. Small varieties may be grown on trellises, but large melons may not be supported well and fruit may break or damage vines as it matures. Some gardeners grow melons on trellises and provide a sling of soft cloth tied to the trellis to cradle developing fruit. Indeterminate tomatoes (those that continue to grow throughout the growing season) vine to heights of 6 feet or more, depending on the cultivar and the growing conditions. Metal or wooden cages provide support for the growing plant and maturing fruit. Some prefer to provide a fence or stakes for support and tie the growing vines to the supports with soft cloth or plant ties. Tomatoes do not produce tendrils and do not cling to a trellis.